Filmed during the summer heatwave, we were sworn to secrecy about this little televisual moment until broadcast. However, this little snapshot doesn’t show the whole story. Week 8: The Apprentice – the whole story! In this episode the apprentices need to sell merchandise and artworks of Scottish based artists. 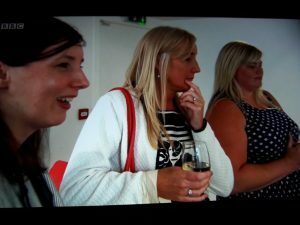 Michelle, having a finger on the pulse of Glasgow’s MediaCity, invited a few ladies along to the gallery viewing they’d organised. Unfortunately for this team (and what you didn’t see on the programme) was that it all went a bit wrong. We came in at the end of the day, just as they sold the jelly teddy “Home Sweet Home” picture out from underneath Oli Norman, owner of ItIsOn’s nose. Oops – Sir Alan was not going to be happy that his corporate art buyer went away empty handed! We’d been chatting to Sabrina and Sian and they were asking what we did etc. 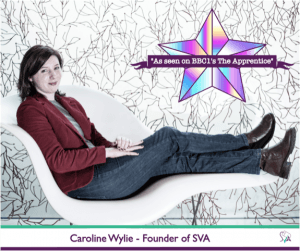 It came out that we knew each other via SVA and how VAs meet up at lots of different conferences – the main one being in London and then several regional ones including the one SVA sponsor in Newcastle. Desperate, they clawed at getting any money at all… which is when I did a rather special deal. For £60 we received all the stock they had left, including the unprinted bags – which we put to good use at Northern VA Collaboration as goodie bags. At a price of £3/item, it was a discount of 90% off their original price of £30 per item. I can see why they didn’t want to show it: virtual assistants fleecing the Apprentices on a deal. It doesn’t look great. But the losing team did have a big argument about who’d sold me the surplus. Let’s settle it: The idea came from Sian. Competition – Win The Apprentice Goodie bag!